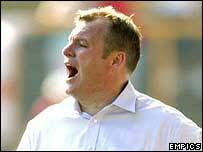 Boston United boss Steve Evans has been warned by the FA that he faces a £1,000 fine unless he improves his behaviour. Evans was given the fine, suspended for a year, after admitting using insulting or abusive words to the match official in October's game against Peterborough. Evans told BBC Radio Lincolnshire: "The FA commission listened very carefully to what I had to say. "They have put something in place that may cost me more in the future if I step out of line." Evans added: "The punishment tells everyone that I've been spoken to."